After the virgin ride with MOB and another one with Tom (which both have blogged about), it was time to do my first solo ride with my new cyclocross bike, at my own pace. 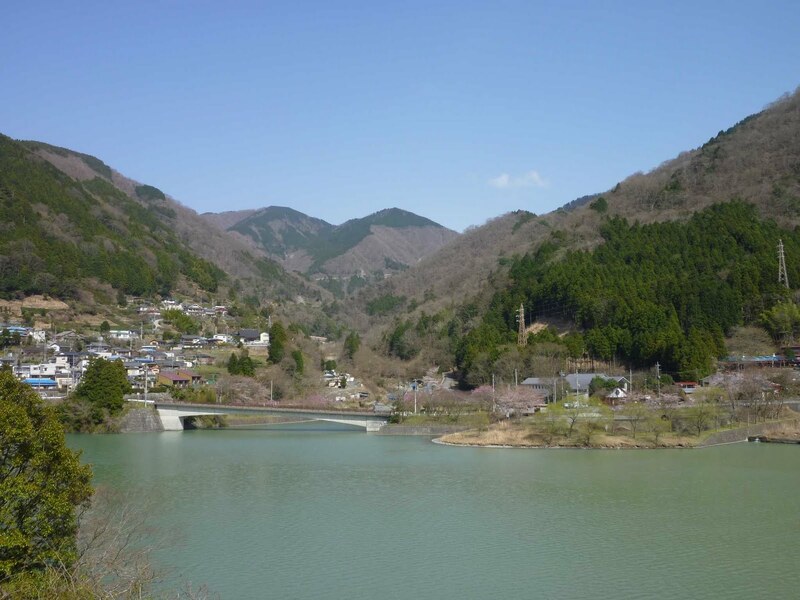 I left home at 6am on Easter Saturday, taking Setagaya Dori and its extension all the way to Aikawa, situated at the foot of Miyagase Lake. 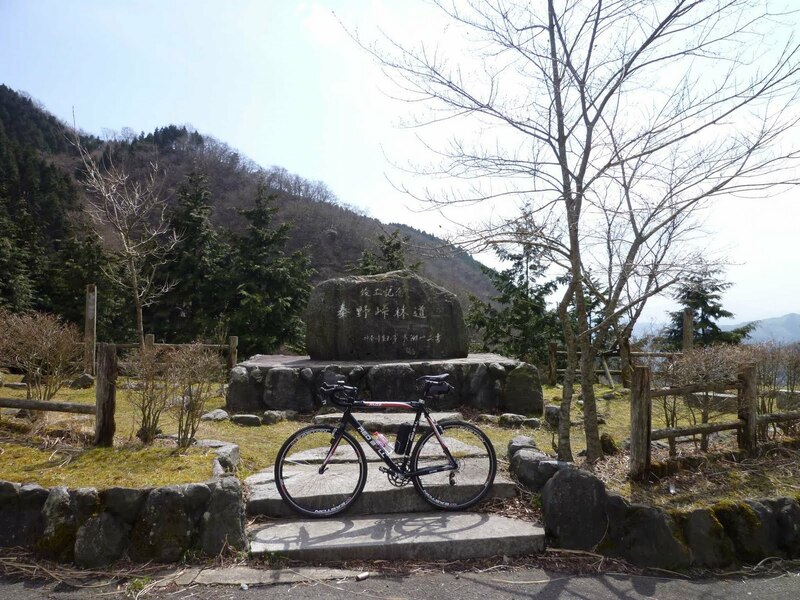 Instead of surrounding the lake, I took a rindo leading up to my first pass of the day, Hanbara Goe at 500m. 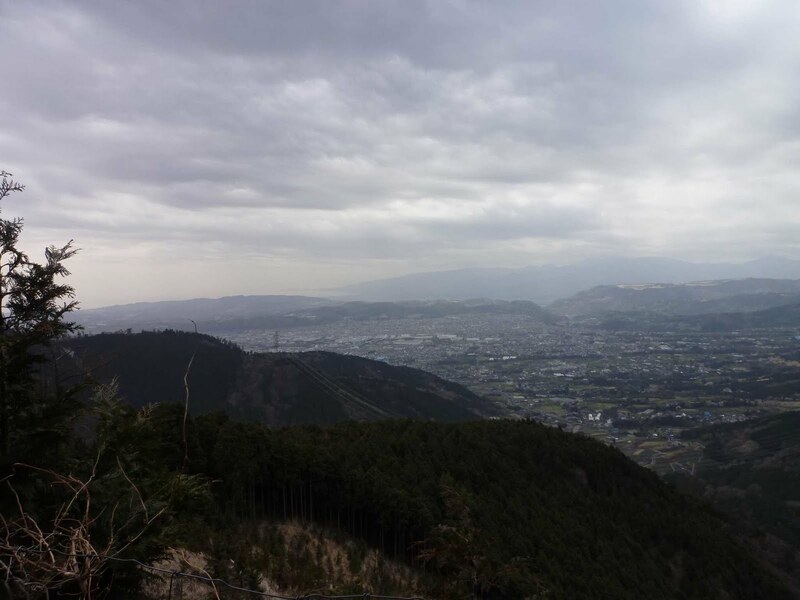 From there down into the next valley (250m) and up through a completely closed off entrance to the next rindo, Monomi Rindo, which presented nice views of the Ebina plain and Enoshima visible in the distance (unfortunately not sufficiently clear to be seen on a photo). Monomi Tunnel was at 600m, and from there it went down again on a rindo full of tree branches and stones to about 400m. 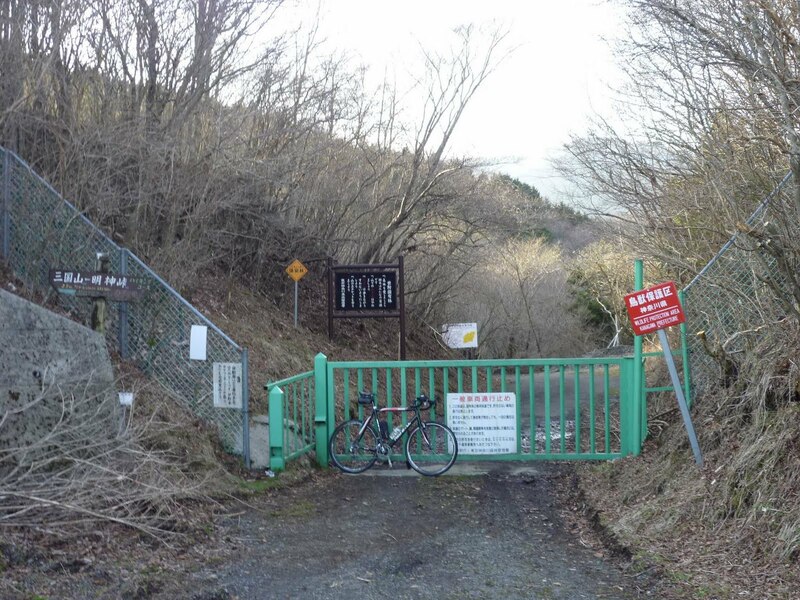 After another 100m climb to another tunnel, I was finally on the descent to the exit onto the road leading up to Yabitsu. There I learnt that the rindo I had just taken was obviously so deserted that even bears were in the area! As I reached Yabitsu Toge (761m), lots of riders were arriving in succession from the other side, in what looked like an informal group race. 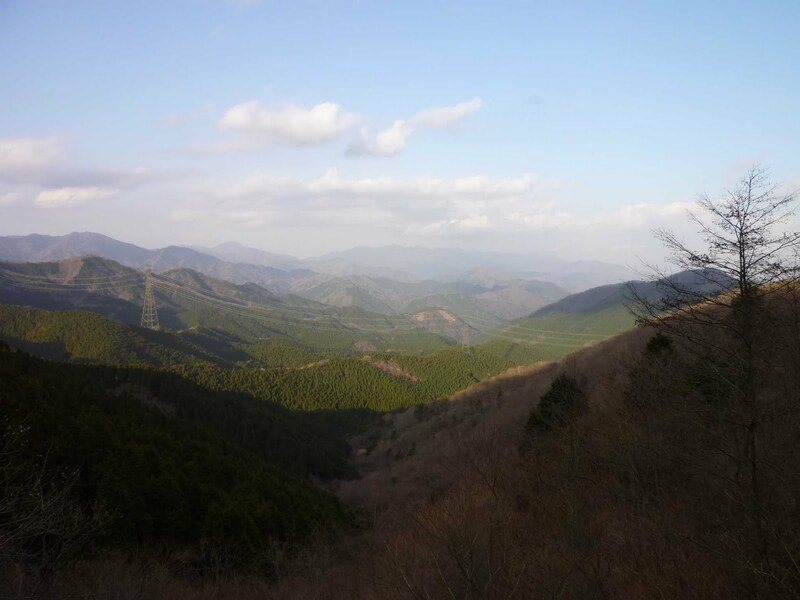 I descended about 100m to the entrance of a rindo, which I had often passed before, but never entered. 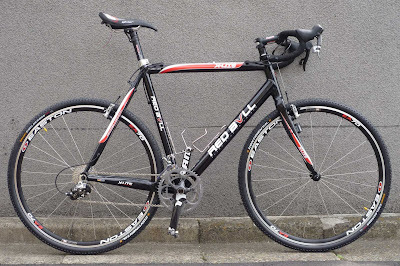 This rindo, too, was sewn with tree branches and stones, but by no means unpassable for a normal road bike. I enjoyed great views of Hadano below and the rindo meandering ahead at relatively even level in the mountains. I passed a group of hikers who greeted me with shouts of "sugoi!". Well, so far not so sugoi. The sugoi part was still to come. I avoid a paved rindos leading down to the left twice and stayed on the main rindo, which eventually started to descend. At about 500m, it ended and led onto a relatively steep gravel road, which I descended another 200m. Soon after this turned into a paved road I reached Hadano Togawa Koen, a large park area along a small river. 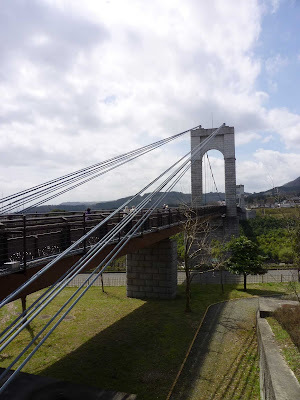 The dimensions of the valley and river hardly justified the monstrous pedestrian bridge, which I crossed by bike. After a quick soba lunch in the park's restaurant, I wanted to find the short-cut rindos all the way through to the ascent to Hadano Toge, which I had passed on the virgin ride with MOB. However, this was easier thought than done. I got lost on a small foot path up a small valley, leading to nowhere. I had to turn back and descend quite a bit, before crossing over into the next valley. The rindo running well above a river to the right quickly turned into a gravel road, running up the valley for rather too long for my taste (maybe 4km, but that's painful on a gravel road). Eventually I reached the end of the valley and the point to return on the other side of it. Soon I was presented with the choice of descending further or turning up another rindo that looked like it would lead me to the right place. I encountered a hiker and he advised me it would end in a dead end... Back I turned, descending further on gravel, until finally reaching a paved road, and then the entrance to the paved rindo that finally looked like it would lead me over to Nakatsugawa valley, from where I wanted to climb up to Hadano Toge. Indeed, this is where I ended up, and after a chat with a couple that were completely surprised a cyclist would dare to enter a road closed to traffic, I was on my way up to 750m. After not feeling too strong in the morning (no surprise after a work of heavy work and little sleep), I was finally able to push ahead at a brisk pace, despite the temperature now being close to 20 degrees. Once again I had a rindo all to myself. Hadano Toge is not actually the highest point of the rindo. There follows a descent of 100m, followed by another 130m climb, and then it is a fast descent with stunning views down to Tanzawa Lake - the same rindo MOB and I had laboured up just two weeks ago. I took a rest again at the same shop on the shores of the lake. This time, the cat was preoccupied with cleaning itself and took no interest in me. I had been debating all along what to do next. 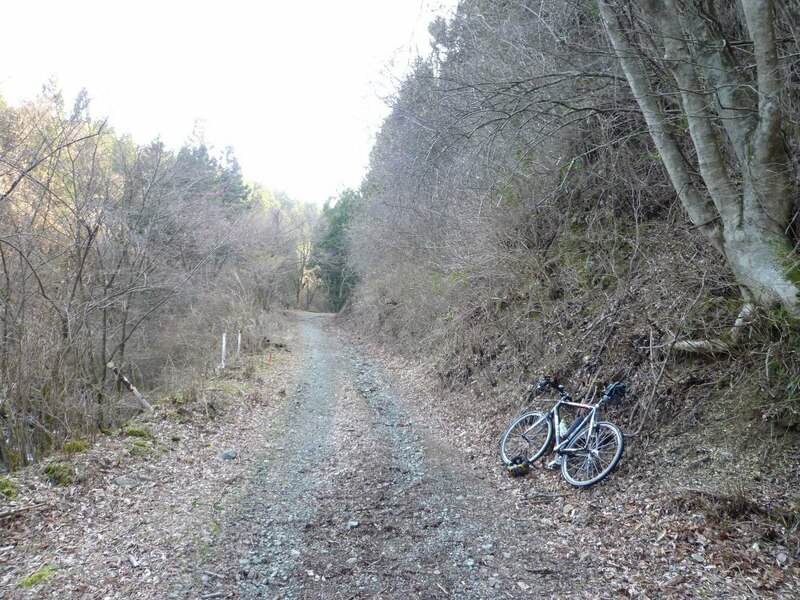 My ambitious plan for the day had been to go on a long gravel climb towards Mikkuni Toge, and make it eventually to Otsuki. But that felt risky. It was already 14:30, that gravel rindo was actually explicitly closed to bicycles and I knew from a reconnaissance ride a year ago that there were aggressive people at the entrance turning away cyclists, and probably for good reason as this would be easily 15km on gravel climbing from 350m to 900m in the middle of nowhere. Another choice was to do route 76 from the south. This would mean climbing to 940m, but all on paved roads, then descending mostly on gravel down into the Doshi valley. From there to Uenohara, Fujino, Takao or Hashimoto. 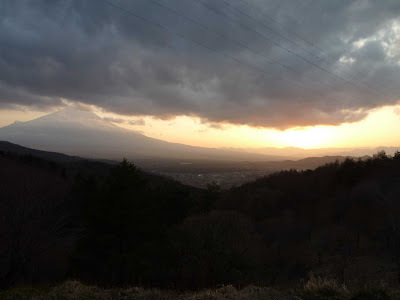 Or of course I could just go down to route 246 and take the old roads to Shin-Matsuda - the easiest way home. But why take it easy? I was out here to explore and have fun. So on I sent to the forbidden valley. 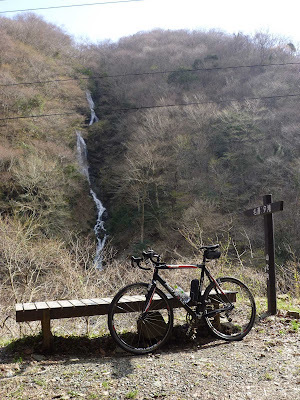 I passed a beautiful waterfall and took the opportunity to open up my layers of clothing, as it was still quite warm and riding on gravel was heating me up even more. Sefugawa was a very beautiful river, quite large and noisy. Nobody was following me, but I passed a few hikers here and there, and wood workers. There was life out here! I still did not feel entirely safe. OK, I was well prepared: there was plenty of water everywhere, I still had some energy bars, I had spare tube and tools. Still, what if I had a problem with my dérailleur or chain, and would have to walk all the way back? I eventually reached a turn-off with a choice between Inukiri Toge which had been sign-posted all along and no directions at all... I was about to continue on the sign-posted rindo when I thought I'd better check against my map. No Inukiri Toge anywhere - instead I wanted to go to Myojin Toge, which is the rindo that comes out onto the main road half-way up to Mikkuni Toge. Turning right and not following the sign-posted rindo felt right, so that's what I did. Soon I reached another Y section, this time not sign-posted at all. Again, turning left felt right if I was to trust my Kanagawa-ken map. On I went. After the first turn-off, the gravel road had started to become steeper, as it was no longer following a river. Fortunately, the steepest parts had a concrete surface, but nonetheless even the more modest inclines felt quite exhausting on gravel. I faced the choice of going out of the saddle and slipping on stones, or putting my weight onto the back wheel and stressing my back. I chose to do both in turns. I had to descend twice for about 100m each, as the rindo was reaching a new side river. How annoying to lose hard gained altitude! 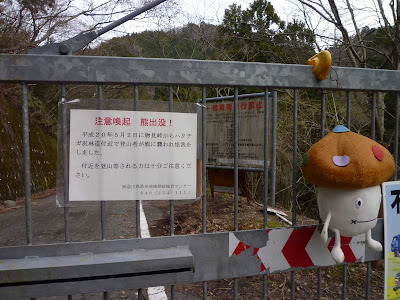 Eventually, signs started to appear that marked the forest property and mentioned Myojin Toge somewhere in the distance. I seemed to be on the right track. The gravel rindo became increasingly steep, and it was another 100m altitude meters to Myojin Toge. Some stretched of paved road appeared where it was particularly steep. 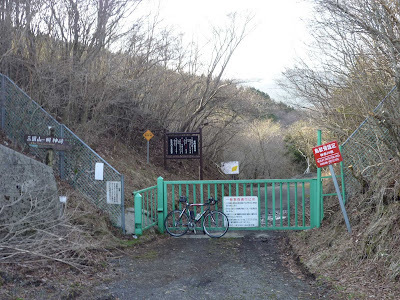 Eventually, I made it, to the familiar looking entrance of the rindo from the climb to Mikkuni Toge. I continued up towards Mikkuni Toge. I thought after this ascent, anything would feel easy, but Mikkuni is just very steep! It was only 5-6 degrees, but I was still sweating badly. The view back into the valley from which I had climbed up was breath-taking. I had made it through this endless sea of forest. After a quick stop at the 7-Eleven in Hirano on the shores of Yamanakako, frequented by hordes of evening shoppers, I continued along the northern shore, then turning north towards Otsuki. Just as I arrived at the pass, the sun was setting - exactly at 18:00. A group of photographers were enjoying the view. So was I, as was getting ready for a descent in fading daylight. By that time it was pretty dark, and I was navigating the stones strewn over the rindo. I had removed my cycling glasses for maximum visibility, but was promptly rewarded by a big insect hitting my head. Eventually, I reached the gravel stretch. Good, just a bit more, and I am back in civilization, I thought. But I had not remembered this gravel stretch to seemingly go on for ever, or so it felt, navigating bigger stones in almost complete darkness. Everything comes to an end, and so did this gravel. Soon there was traffic, and when there were cars behind me, I enjoyed their lights helping me see the surface of the road. I had hardly turned onto route 139, when a young woman driver almost wiped me off the road, turning left just mili-seconds after putting on the indicator. Fortunately I was prepared for exactly this to happen and was able to stop and turn with her on time. I told her off - she was completely surprised, i.e. had not even thought about looking into her back mirror. The rest of the ride was uneventful. I arrived at Otsuki station at 18:15, a bit over 13 hours after I had left home, of which I spent 9h15 in the saddle. 194km with just over 4,000m of climbing on the BBiT scale*. The new bike has been serving me well so far. It is very comfortable to ride, in fact, more comfortable than my road racer. The wheels absorb shocks better, yet the frame is extremely stiff. Downhills are fantastically stable. I haven't had the chance to go over 60km/h, but even at that speed it feels just so safe and stable. The tyres take away a bit of energy, but not an enormous amount. At the same time, no problem going over debries and tree branches on the road, and without slipping as easily over them as on the road racer. No matter how bad the road, no descent has been dicey so far. With this bike, I seem to be prepared just for any conditions. 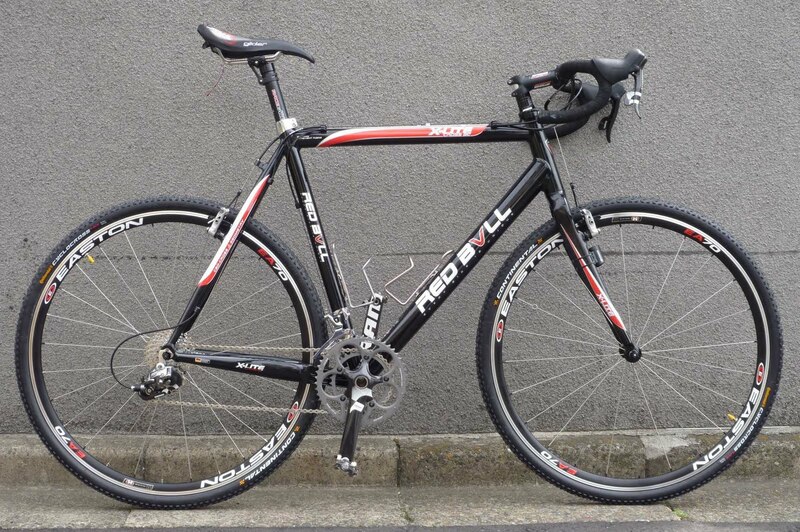 And as I like solitary rindos, and there still seems so much out there to discover, I might end up using the cyclocross much more than anticipated when I decided to buy it. * BBiT = Blind Believers in Technology, i.e. as measured by barometric devices like Garmin, Ciclo etc. For this ride, this translates into a bit over 3,000m of true climbing, some of which was made particularly hard by gravel. What a tour de force of you again Ludwig! Have never been on Nijumagari myself...sounds very challenging! Keep up the cyclocrossing! Ludwig, I like the BBiT you coined! Someday, hopefully, we will all be using identically same yardsticks and someday, hopefully, I will emerge King of the Elevation Gain ("KOEG")! Haha!! It certainly felt very much lonely and deserted and I encountered an Inushishi (wild boar) along the road. 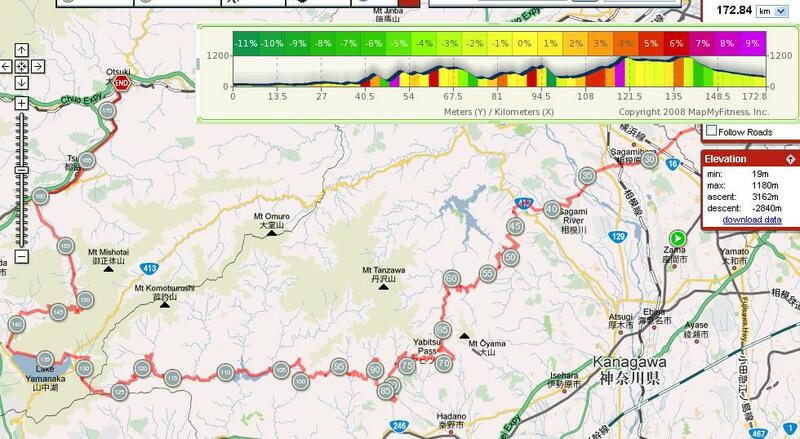 Would love to do the ride from Yabitsu to Tanzawa. 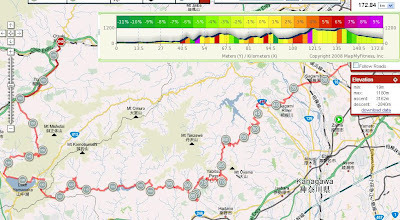 Nice report--impressive alternate route to Yamanakako! I'll need to review it carefully to study which sections can be ridden with regular road bike tires. Tom, Nijumagari is easy. You can do it in a nice loop from home. 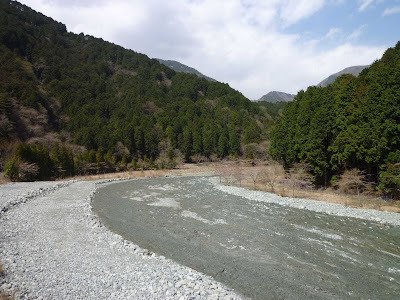 The harder part is climbing up through the Yozukogawa valley to Myojin Toge, on that 15km gravel road. And I guess just to prove nobody is perfect, I do misspell the occasional word, and don't even realise it... Thanks for pointing it out. MOB, yes I was fully aware you had gone that rindo from the other end. Just like you I encountered some wild animals - deer in my case. I also saw more deer on the descent in the dark from Nijumagari Toge, and an unidentifiable smaller wild animal in Yozokogawa valley. I would love to encounter a wild boar or even a bear one day! David, you can go all the way to Tanzawako on paved rindos. Still lots of debries on them, but doable. You will need to leave the rindo after Yabitsu at the second turn down to the left, then work yourself through to the road that leads up to the rindo crossing over to Nakatsugawa. I can map it out for you one day or we can do it together. From Tanzawako the only way out is to the south though, if you have a normal road bike.